You may have seen some of our work embedded into the streetscape along Railway Street. 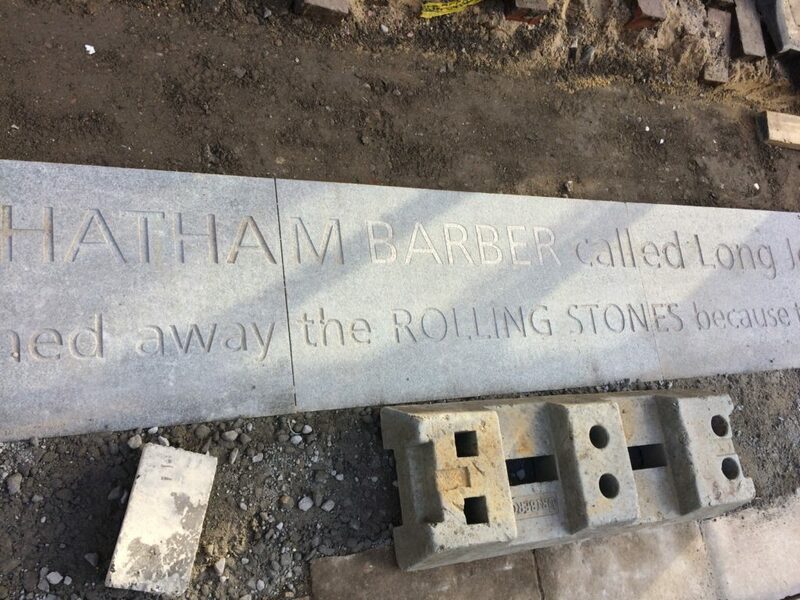 Large scale granite kerbs contain words sandblasted or inlaid into the surface. You may wonder what these words mean, or how they relate to you. Here is a short explanation of how they came about. You may know that the aim of this public realm project was to upgrade the route from Chatham Station to the Waterfront. This includes pedestrian and cycle routes as well as crossing points, upgrading paving materials, improving steps and ramps, opening up the public realm and streamlining access and pedestrian permeability. This work was driven by Francis Knight, Public Art Consultants & our project collaborators and consultants to Medway Council, LDA Design and Project Centre. We wanted the streets to speak quietly, confidently & with good humour about Chatham…WHAT MAKES A TOWN ?…THESE ARE OUR STREETS…part memorial, part living voice…but mostly a celebration of the rich heritage and community of Chatham. Chatham Placemaking Project. 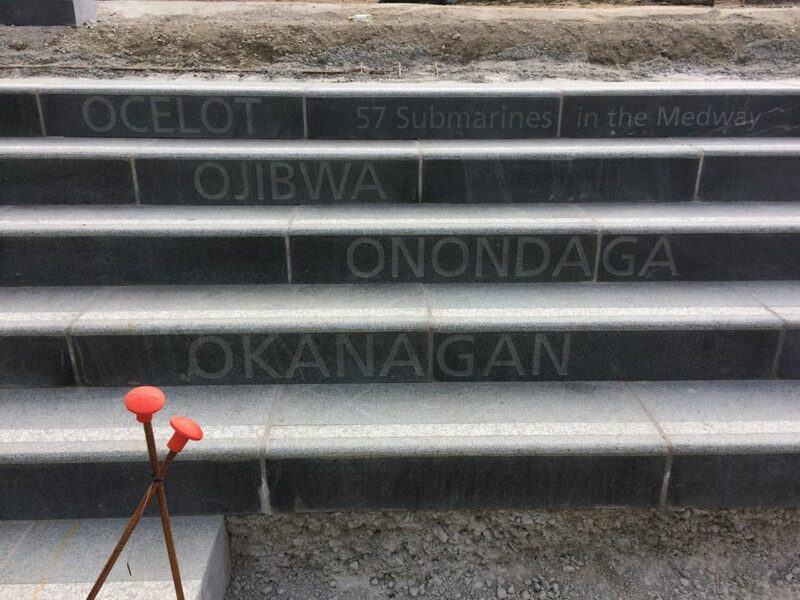 57 Submarines. The route from the Station to the Waterfront takes us down Railways Street & Military Road – in doing so we pass several key places, such as New Cut ( a former farmyard), St John’s ( a Grade II Listed Waterloo Church) – Military Square, considered the Heart of the Town. 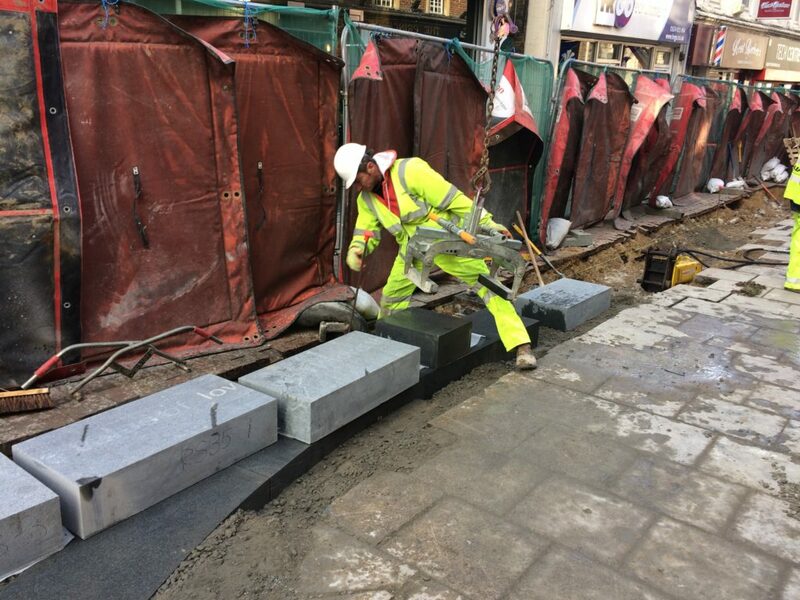 At these important sites, we have made interventions to articulate the granite kerb in ways which are expressive and of interest, whilst still maintaining functionality. We were keen to hear and to record everyday voices …words spoken by ordinary people – such as ‘the girl who cried when she lost her phone and then cried again when she found it’... ‘the lovey barmaid’ …or ‘Colin, the man who carried coal for charity’…these are the voices of people on the street, passers by, people shopping & passing the time of day. We engaged with people directly in conversation, we overheard the conversations of others, we wrote down and recorded stories and anecdotes we were told. I was very fortunate to collaborate with other artists on this project. Filmmaker Simon Williams succinctly and with an understated eye for visual language and movement, cleverly framed our project parameters and vision in a series of short films, whilst printmaker Xtina Lamb rendered our architectural vision into graphic patterns & motifs used throughout the scheme. Both artists also live in Chatham, bringing their individual & unique perspectives to play. However, it was the award winning writer Rob Young, who contributed significantly to the embedded text. An astute, profound and funny wordsmith with an ability to engage anyone and everyone, turning their words into poetry along the way. “The knitter. Whose name is Pearl. The woman. Who uses the word ‘like?’ As like, punctuation? The woman. Who said sorry. When you’re the one who pushed in. The woman. Who draws breath. Then monologues. For an hour. The waiter. Who had a fling. With a Bride. At her wedding. The girl. Who cried. All day. When she lost her phone. Then cried again. When she found it. The boy. Whose Mum. Made him take back the sweets. That he stole. 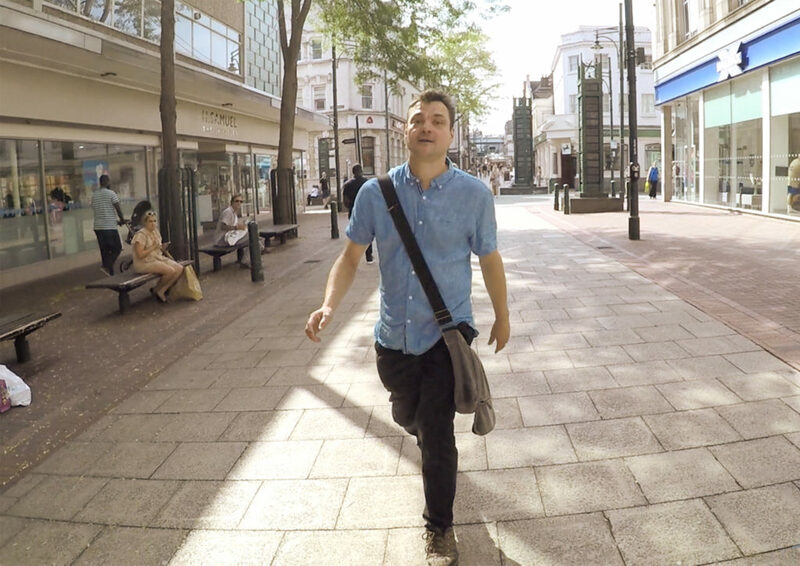 Justin Coe, a poet and writer also contributed, animatedly performing his work directly to camera, whilst walking the route in a film by Simon Williams. Local school children & people working in local businesses were asked for their comments. We listened to them & heard their stories. We listened to the sound of their lives. There is an overwhelming sense of common ownership in this project. These words are not ours. They belong to Chatham. 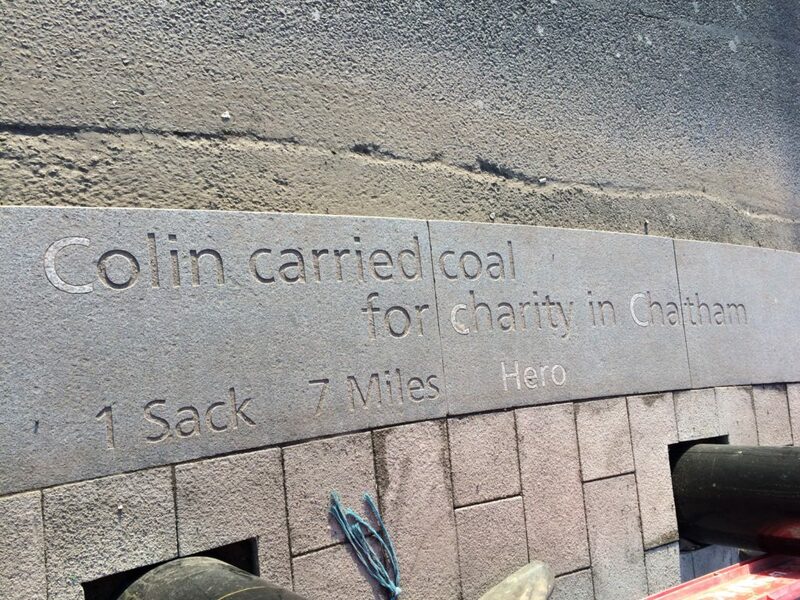 Our work in Chatham set out to find and hear voices and words which quietly & evocatively create a sense of place associated with each of our stopping points on the route from the Station to the Paddock… the power of these voices is amplified by the weight and mass of the monolithic granite. So this is what you do when you go into hiding… A very interesting read, really enjoyed it.